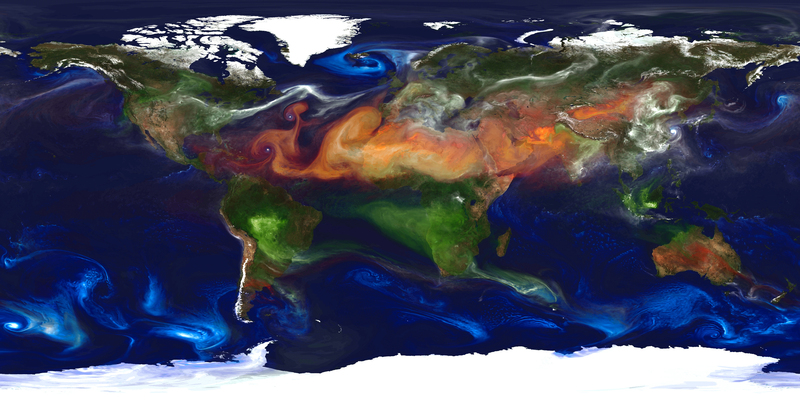 I came across this quite stunning image today, depicting the movement of global aerosols across the planet. Click on the image above to see the high resolution version from NASA. It’s really very beautiful but at the same time provides a stark reminder about some of the environmental issues we face on a global scale. “High-resolution global atmospheric modeling run on the Discover supercomputer at the NASA Center for Climate Simulation at Goddard Space Flight Center, Greenbelt, Md., provides a unique tool to study the role of weather in Earth’s climate system. The Goddard Earth Observing System Model, Version 5 (GEOS-5) is capable of simulating worldwide weather at resolutions of 10 to 3.5 kilometers (km). No information is given about the time frame over which this image was constructed, or of the direction these aerosols are moving, but it gives us a good idea of the main airborne particulates in our atmosphere and where they are found. Of particular interest are the large swathes or red/orange that extend across the centre of the map, extending through Saharan Africa, the Middle East and into China. This dust (and sand presumably) originates from the vast swathes of desert regions in these areas and hints at the problem of desertification that all these regions suffer from. The white ‘clouds’, which represent sulfate particles (mostly from fossil fuel emissions one presumes, rather than volcanoes) linger over eastern China, India, eastern Europe and the east coast of the USA. This image is a great example to remind us that environmental issues connect us all across the world. Country borders are quite irrelevant when it comes to some of the larger environmental crises that we are facing. This is my new desktop background image!